Steven Kasher Gallery is honored to present a solo exhibition of photographs by Takehito Miyatake, one of Japan’s rising stars in the field of nature photography, and the recently announced Grand Prize Winner of the second Nikkei National Geographic Photo Prize. This marks Miyatake’s first exhibition in the United States. His work follows a rich tradition of Japanese naturalist art. Takehito Miyatake’s work explores the interplay between what he describes as the “light of Japan” and the natural landscape, and the connection between land, water and sky. 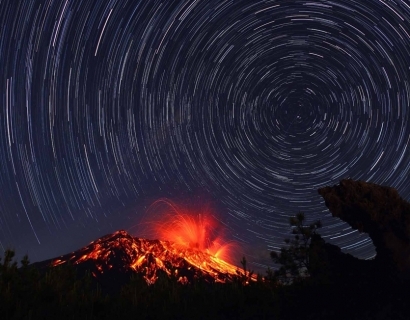 His noted series of photographs of the Sakurajima volcano taken while erupting are shown alongside images of tranquil water bays with rocks and boats reminiscent of Japanese scroll paintings, a bridge surrounded by streaks of light produced by the glow of fireflies in flight, a wooded area with bursts of light glowing like lanterns, a moon rising above black lava rock, and a star trail rendered in concentric circles that shows the spinning motion of the Earth. Miyatake draws inspiration from contemporary waka poet Utsubo Kubota. Waka is a form of classic Japanese literature that traditionally reflects the human heart’s response to nature. Miyatake’s work reveals his passion for his homeland that is still recovering from the devastating Tohoku earthquake and resulting tsunami of 2011. His use of color and light celebrates the mystical beauty of Japan’s landscape. Nikkei National Geographic Inc., a joint venture of The National Geographic Society and Nikkei Business Publications founded in 1994, sponsors the Nikkei National Geographic Photo Prize. The mission of the prize is to showcase and raise the profile globally of promising photographers from Japan. Prize entrants can submit work under the categories of the “natural world” or “people and communities”. The work is judged for its aesthetic appeal, and most importantly, the photographer’s knowledge of his subject and ability to communicate it through the medium of photography in a manner that evokes a sense of wonder and discovery, excitement and inspiration to a diverse audience internationally. In January 2014 it was announced that Miyatake is the second Grand Prize Winner of this prestigious award. The prize package includes one million yen in cash from Nikkei National Geographic, and camera equipment donated by Canon Marketing Japan. Nikkei National Geographic is the publisher of the Japanese edition of National Geographic, the first foreign language edition of the world famous magazine that since 1888 has harnessed the power of photography to help inspire people to care about our planet. Miyatake’s photographs were published in the February 2014 issue of the Japanese edition of National Geographic. Takehito Miyatake, born in Osaka, Japan in 1966, graduated from Tokyo Polytechnic University in 1988. While at university, he met and was influenced by the work of the renowned Japanese landscape photographer Yoshikazu Shirakawa. From 1988-1994, Miyatake served as a company photographer at Noritz Steel Machine Company that is located on the Kii Peninsula on the island of Honshū. It was here that Miyatake began photographing the natural world with a 4 x 5 medium format camera focusing on the peninsula’s picturesque water bays. In 1995, Miyatake moved to Tokushima on Shikoku Island where he established the Miyatake Photo Studio and continued to photograph Japan’s beautiful bodies of water. 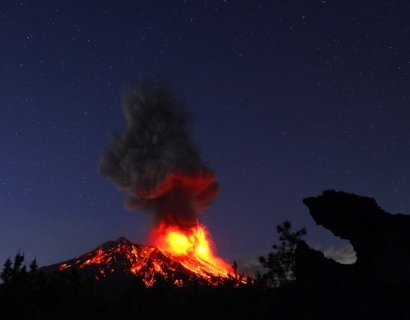 In 2009 Miyatake began shooting Sakurajima, one of the world’s most active volcanoes, and a former island in Kagoshima Prefecture in Kyushu. He was fascinated by the brilliant colors and light generated by the volcano’s frequent explosive and violent eruptions. It is his photographs of Sakurajima that established him as a globally known photographer. His work has been shown in eleven solo and group exhibitions in galleries and museums throughout Japan, and been published in five photo books, most recently Living Earth Sakurajima (PIE International, 2013). Steven Kasher Gallery (www.stevenkasher.com) specializes in fine art photography, contemporary and vintage. The gallery works with important photographers and major photographic archives such as the National Geographic Society, the New York Times, the Andy Warhol Foundation and Magnum. Steven Kasher and the gallery have published and authored many photo books, including on the Civil Rights Movement, Mike Disfarmer, Max’s Kansas City, John Chamberlain, Andy Warhol, among others. Founded in 1995, Steven Kasher Gallery is a member of AIPAD since 2000.